16th/17th C, Sophora, Shanxi. Of rare extinct wood; tall back and wide seat suitable for today; all-original. This kind of armchairs belongs to the type known as “guanmaoyi” (official’s hat chair), the name deriving from a supposed resemblance to the winged hats which were part of the formal dress of Ming officials. It is amongst the most prestigious chairs in a traditional household though the vast majority of the population never sat on high chairs of this type. In old Chinese culture, it has the connotations of status and authority. 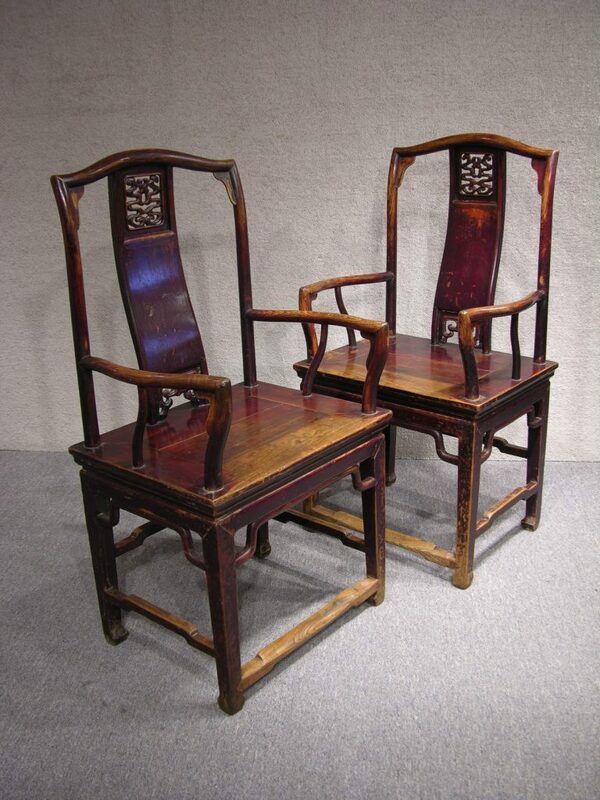 This pair of chairs is quite rare because it is made of Sophora, a wood that became extinct after the Ming period. This tree grew only about an inch a year, so its wood is very dense and strong; since it also resists moisture and insect damage, and doesn’t warp, it was the wood of choice as building material for the Ming literati. Its over-use, however, caused the tree’s demise and decimated its supply for furniture building by the end of the Ming period. Furniture made from this wood is commonly attributed to this early era. Each chair is of the waisted, corner-leg construction. It displays a tall, elegant stance, with the seat back well suited to someone with a tall statute. The graceful, undulating S-shape backrest is sectioned off into three parts, with openwork finely pierced ‘chi’ dragons (a motif in China associated with power) at the top, a plain middle section, then a scrolling ‘continuous life’ motif at the bottom. There are shaped spandrels beneath the top rail. The rounded crest-rail, armrests and side-posts together create a charming impression. The chair has a hard seat panel molded at the edges. Below the seat, the waist and apron sections are made of one piece of wood. Together, they are securely attached to the underside of the seat. The seat is strengthened by decorative, deeply-shaped humpback stretchers attached under the aprons and sides of the legs in the front and sides of the chair. The humpback base stretchers are stepped towards the back. This configuration is traditionally considered to imply “ascent with each step”, meaning to promote to high places. The legs terminate in horse-hoof feet with the foot stretcher bearing sign the chair was much-used. This pair of chairs survived in excellent condition, retaining much of its original rich deep reddish-brown lacquer. Its survival is due much to its strong building material. It is seldom known but furniture made of this wood has historical value because according to a Chinese historical chronicle by Lin Yutang: “Imperial Peking, Seven Centuries of China”, the last Ming Emperor, Tsungcheng, hang himself on a Sophora tree in palace ground in 1643 when he realized he was about to lose his kingdom. The Sophora is not well-known in the West because not many furniture survived the Yuan and Ming periods to find its way to the West.